Home > Public Service > Politics > All Aboard the Democrat Special! Back before I-90, when driving from Seattle to Spokane meant Highway 10, a/k/a The Sunset Highway, slowing down to 25 to go through small towns and speeding up to 50 on the straightaways; and flying was for very special occasions, the best way to travel was via the rails. 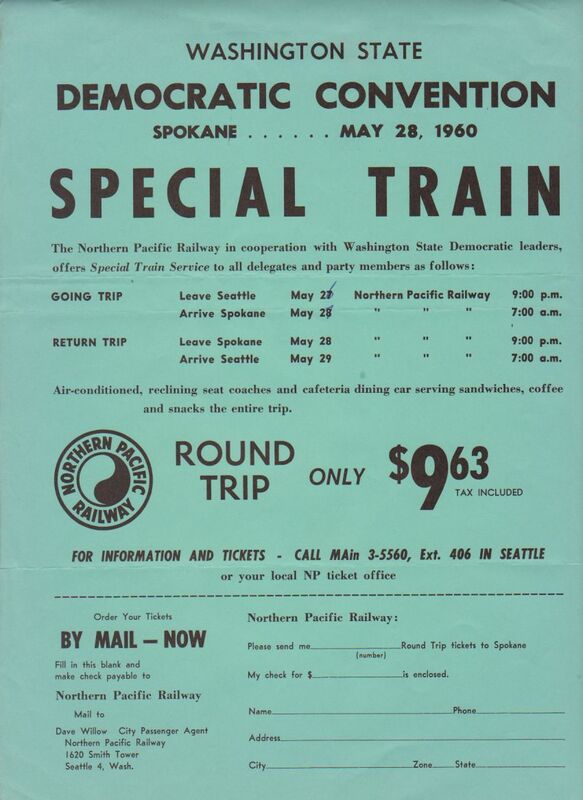 For the 1960 Democratic State Convention, held in the Spokane Coliseum on May 28, Northern Pacific RR put on a "Special Train" at a special price. Round trip from Seattle-Spokane was a whopping $9.63 and the trains left in the evening and arrived in time for breakfast. The flyer mentions the cafeteria dining car service, but not a Club Car. That probably meant flasks, lots of flasks. Oh, heck, we're talking political convention delegates in 1960. They weren't using flasks, they brought full-size bottles.